(Bloomberg) -- Today in Brexit: It’s 1,000 days since the U.K. voted to leave the European Union, and nine days until it’s due to happen. Who among us hasn’t bumped up against a deadline and asked for a bit more time? You and I might have pleaded with tutors, bosses, bank managers, editors, board members, maybe even lawyers. Theresa May is writing to the man who heads the European Union, asking for more time to figure out how to leave the club. With Brexit day still officially scheduled for a week from Friday, the prime minister has decided not to ask for a long delay, her office said. 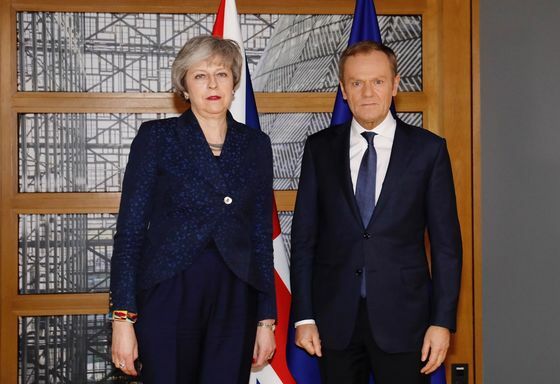 May can explain why she wants a short pause — she still wants to get her twice-rejected Brexit deal through Parliament — but European Council President Donald Tusk, the addressee of May’s letter, says he wants government leaders to be open to a long extension if needed. That comes with a rider: Key figures including chief negotiator Michel Barnier and French President Emmanuel Macron were clear on Tuesday that if the U.K. wants an extension to the Brexit process, the government needs to explain why. A longer extension would require the U.K. to take part in European Parliament elections in May, which need to be arranged during April, Ian Wishart reports from Brussels. If the U.K. doesn’t take part and doesn’t pass an exit deal it will be ejected in July, according to a draft EU plan. May is due in Brussels for a summit with fellow leaders on Thursday. With tension rising on both sides, an emergency meeting could be needed the following week to sign off on an extension. A senior British official warned against taking for granted the notion that the EU would easily agree to a delay this week. Tuesday’s Cabinet was badly split; pro-Brexit Tories met last night seeking to stand firm against any long postponement. Labour’s Jeremy Corbyn met parliamentary proponents of a soft Brexit. And markets stayed calm, convinced the biggest risks have passed. Yes, Brexit needs explaining, and we’re here for you: These are the key dates to watch, and this is your guide to the Brexit deadline. Donald Trump Jr., the son of the U.S. president, writes in the Telegraph that Theresa May should have taken his father’s advice on Brexit. The even spread of Leave votes around the U.K. explains why many Remainers were so surprised at the 2016 election result, former Remain staffer James Kanagasooriam says in The Spectator. Market Optimism | There are mounting signs that traders are discounting the worst possible Brexit outcome, write Eddie van der Walt and Charlotte Ryan. 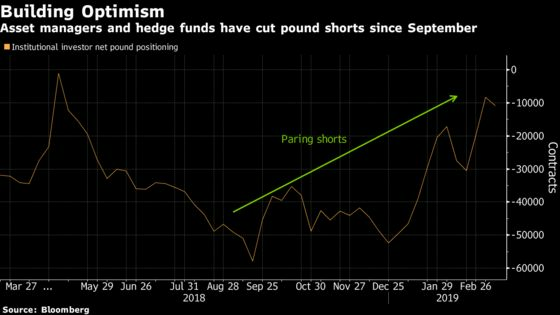 The pound has outperformed every major peer this year, rising more than 4 percent against the dollar. Small and medium-cap equities, credit markets and carbon have also performed above expectations recently. Upheaval Threat | A last-minute spat over equity trading threatens to destabilize markets after Brexit, Silla Brush reports. The European Securities and Markets Agency says EU firms must trade certain stocks on platforms based in the bloc, and not on U.K. ones — even if their main listing is in London. Vote Leave Fined | The official pro-Brexit campaign from the 2016 referendum was fined £40,000 ($53,000) for sending thousands of unsolicited text messages to people in the run-up to the poll in June that year.